The Palenque archaeological site has well-preserved Mayan ruins. It is nestled in a gorgeous steep-hill landscape blanketed by a lush tropical forest. Palenque dates back to at least about 100 BC. Its glory days were from 600 to 800 AD. Within a 100 years, the city-state collapsed and was abandoned to the encroaching forest. This building (see left side of photo) is best known for its long, stone-carved glyphic story board, a Mayan masterpiece. And, Pacal, the greatest of Palenque rulers, is interned underneath the edifice. It sports a distinctive four-story tower and has a rambling complex of rooms and courtyards. See right side of photo. Other major attractions include the Temple of Cross Group and the Temple of Jaguar. More likely to be revealed in the years to come - only a small fraction of the structures have been excavated. 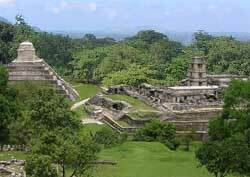 Some temples offer great views of Palenque and of the luxuriant forested plain stretching to the Gulf Coast. But their steps are steep and short-treaded, so wear comfortable, good-grip shoes.